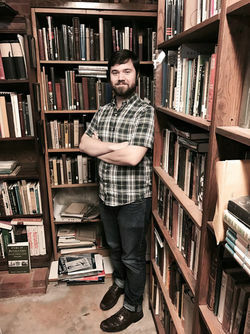 As a small, independent bookseller in Cleveland, Ohio, I deal in general used, rare, and antiquarian books, autographs, manuscripts, pamphlets, and personal and family papers in all subjects. My family has been in the antiquarian book business since 1971. Are you moving, downsizing, or doing some spring cleaning? Did you inherit or otherwise come into some old books? Or, maybe you've collected modern novels from the last thirty or fifty years. No matter what kinds of books you have, we'd love to take a look at them! We travel throughout Ohio, western Pennsylvania and New York, southern Michigan, and eastern Indiana, and will travel farther in some cases to look at whole libraries or even just a few particularly interesting books. Give us a call at (216) 352-3940 and we can talk more about the kinds of books you have. Terms of sale for Cleveland Book Company All books are returnable within ten days if returned in the same condition as sent. All books in my inventory are authenticated and described to the industry's highest standard of professionalism. Payment should accompany order if you are a new customer. Current customers will be invoiced with payment due in 30 days. Institutions billed per their requirements. ALL ITEMS SUBJECT TO PRIOR SALE. Books sent via US Postal Service unless other arrangements are requested. INTERNATIONAL PURCHASES WILL BE SHIPPED AT THE EXACT COST. NOTE: USPS NO LONGER SHIPS SURFACE MAIL TO OVERSEAS. Where possible, we will ship GLOBAL PRIORITY, minimum charge of $23.95, maximum weight 4 pounds. For packages over 4 pounds, you will be contacted with exact charges. Ohio residents please add 5.75% sales tax. We accept VISA, MASTERCARD, DISCOVER, and AMERICAN EXPRESS.